Florida and Wisconsin now have official dates on the calendar. UPDATE: Politico's Reid Epstein is reporting this evening that the Nevada GOP is holding an emergency Executive Committee meeting tonight. That obviously changes the outlook of the calendar. Also, it looks like states/state parties are heeding the October 1 deadline, penalty-less though it may be. Veteran Nevada political reporter, Jon Ralston, tweeted earlier that the Nevada Republican Party was considering a first week in February caucus. That would keep the party's contest compliant -- in February for an exempt state -- and not cost the Nevada GOP half of their 28 delegates. He also just now tweeted that the meeting tonight was not decisive and that the Executive Committee will meet again on deadline day tomorrow. [Nevada GOP chair Amy] Tarkanian said she didn't know what date Nevada might choose, but she wanted to ensure the state holds its caucuses ahead of most states so the date could shift toward Feb. 1. The Nevada Democratic Party criticized Florida for disrupting plans by the two main political parties to establish a presidential nominating season designed to make more states count. "Florida's announcement today risks the integrity and intent of the presidential nominating calendar and is a blatant violation of the rules agreed upon by the national committees of both parties," Party Chairwoman Roberta Lange said Friday in a statement. Lange also said Nevada Democrats might move up the date of their presidential caucuses to sometime in January in reaction to Florida moving its primary to Jan. 31. Nevada is the new Florida. Now that Florida is officially on the 2012 presidential primary calendar, all that is left to figure out at the front is where the earliest four exempt states will position their primaries and caucuses. Iowa, New Hampshire, Nevada and South Carolina now have 30 days in which to fit four nominating contests. As we mentioned earlier today -- post-Florida -- South Carolina is fairly easy to place. The latest possible date South Carolina could and likely will fall on is Saturday, January 28. But when it comes to the next two pieces in the puzzle -- Nevada and New Hampshire -- have a conflict and it won't/can't be dealt with until October 22 at the earliest. Again, the Nevada Republican Party over the summer changed the rules surrounding the party's precinct caucuses, coupling the scheduling of Silver state Republicans' contest with the scheduling of the New Hampshire primary. The rule calls for the Nevada caucuses to fall on the Saturday following the New Hampshire primary. That creates a conflict with the Granite state. New Hampshire law requires that the primary there be scheduled for a date that is seven days prior to any similar contest. Something has to give and as I suggested earlier, that give is likely going to come from Nevada's end. New Hampshire would have to change its law or settle for a non-Tuesday election date. Neither of those are likely to happen and Bill Gardner is willing to threaten to take Nevada and Iowa into 2011 as leverage to gain more than four days separation from Nevada. Plus, it is just easier for a party to change a rule than it is for a state legislature/government to change an election law -- especially when it is out of session. That brings us back to October 22. That is the date on which the Nevada Republican Party Executive Committee meeting will occur according to Karoun Demirjian at the Las Vegas Sun. South Carolina may or may not weigh in before then -- sooner probably rather than later -- but Nevada will not be able to address the conflict with New Hampshire until late October. That, in turn, will impact when New Hampshire and then Iowa will set their dates. And by that point we will be two months out from the likely start of the primary season. Wisconsin Governor Scott Walker today signed SB 115, moving the Badger state presidential primary to April 3 and back into compliance with national party delegate selection rules. "Holding Wisconsin's presidential primary election on the same day as the routine spring elections will make the administration of our elections more cost efficient-saving valuable taxpayer dollars," Walker said in a release. "I was pleased to sign a bill into law this morning that received support from Republicans, Democrats and the Legislature's one independent member." FHQ will skip the hemming and hawing over the Florida Presidential Preference Date Selection Committee decision to schedule the Sunshine state primary for January 31. That is being covered adequately elsewhere. Now that Florida is locked in to a non-compliant date, however, what does it mean for the likely calendar positions Iowa, New Hampshire, Nevada and South Carolina will adopt? One less state up in the air means there are fewer scenarios that are plausible. FHQ sees three most likely scenarios and they obviously depend on a couple of things. 1. If South Carolina Republican Party Chair Chad Connelly is to be believed, then South Carolina Republicans will hold a January 28 primary -- the latest possible date that keeps Palmetto state Republicans ahead of Florida. 2. The one thing that will settle how the rest of the calendar looks is what is going to take place between Nevada and New Hampshire. Nevada Republican rules now call for the caucus in the Silver state to be held on the Saturday after the New Hampshire primary. That violates the New Hampshire law calling for a seven day buffer between the Granite state primary and the next contest. Something will have to be worked out and it is likely to favor New Hampshire if only because the New Hampshire General Court (legislature) is not likely to reconvene and change the law. Changing a party rule is much easier at this point. New Hampshire Secretary of State Bill Gardner has been pretty clear that Nevada coming on the heels of New Hampshire -- the Saturday after -- is a nonstarter. That all but eliminates Option 3. What is at issue, then, is what Nevada is going to do assuming South Carolina decides on a January 28 primary. Will they go a week earlier than South Carolina, change their tether rule and allow New Hampshire to go eleven days earlier or will Nevada opt to change the rule and hold a weekday -- Tuesday, January 24 perhaps -- caucus? Again, assuming South Carolina ultimately settles on January 28, that Nevada question will be the one to solve the rest of the calendar. This one is 3a and not 4 because New Hampshire making any changes or breaking from the tradition of going on Tuesday is far-fetched. But FHQ should make note of the fact that New Hampshire law does not require Bill Gardner to set the date of the primary on a Tuesday. That likely won't happen, but neither will December primaires. The Florida Presidential Preference Primary Date Selection Committee today selected January 31 as the date of the Florida presidential primary. In Missouri, Could a Switch to Caucuses Help Avert a January Start to Primary Season? Georgia and Missouri Republicans are now officially on the calendar. KY3 in Springfield has the story. *The State Convention will take place on June 2, 2012. At the convention, delegates chosen at the county level will vote on 26 at-large delegates and alternates to the National Convention and 2 at large presidential electors. 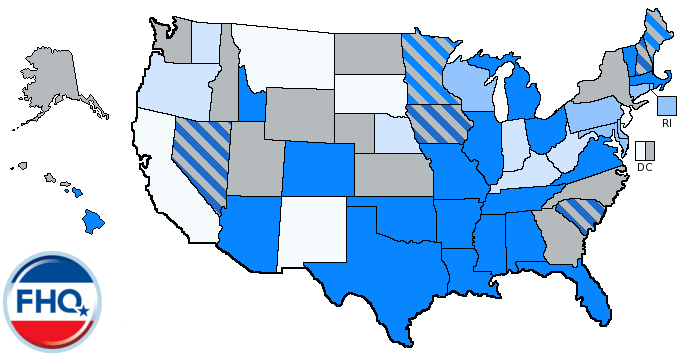 The delegates and alternates will be required to declare allegiance to a candidate prior to the voting, and they will be bound to that candidate on the first ballot—unless they are released prior to the convention.In total, Missouri will have 52 delegates and 49 alternates to the Republican National Convention — 24 selected at the congressional district caucuses, 25 selected at the state convention, and 1 delegate (but no alternate) for the state Party chairman, national committeeman and national committeewoman. The ball is definitely in Florida's court now. We'll move the Missouri Democrats to "No Date" for the time being, but FHQ fully expects the party to utilize the municipal ward caucuses already scheduled to begin on March 29. Until that announcement, however, FHQ will keep them as undetermined. That the Missouri Republican Party is considering a switch from a non-compliant to a non-binding primary -- adopting a caucus/convention process as a means of allocating their presidential delegates -- has been discussed today. One interesting thing that has not been as widely discussed, however, is the timing of the Missouri Republican Party State Central Committee meeting/announcement to address the primary conundrum in the Show Me state: Thursday night. 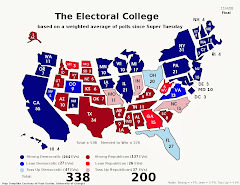 If that announcement on the eve of the Florida Presidential Preference Primary Date Selection Committee's likely decision to shift the Sunshine state primary to January 31 pulls the Missouri delegate selection process back into compliance with RNC rules and out of Florida's way, does that also trigger a reconsideration of the primary date in Tallahassee? Beyond that, is the presence of non-binding caucuses in Colorado, Maine and Minnesota in early February enough to keep Florida on January 31? Again, the special session stalemate over the presidential primary legislation in Missouri is the impetus for Florida's expected jump back into January after a brief summer respite. The rollercoaster ride of bill passage, vetoes and special session gridlock in the Show Me state throughout 2011 is seemingly the biggest roadblock now to the national parties' efforts to have a delayed start to the 2012 presidential primary calendar (relative to 2008). Some are questioning the legality of a potential move away from a primary to caucus in Missouri. As has been mentioned elsewhere, there is nothing in the Missouri Revised Statutes that requires the results of the state's presidential primary be used as a means of determining the allocation of delegates. There is a good reason for that: Delegate allocation is something that is left up to the parties to determine. Granted, most everything in the presidential primary process is left up to either the state or national parties to decide. A nomination is, after all, a party function not a state one. What puts the states in conflict with the parties is the issue of most state parties opting into a state-funded primary election. Opting in brings with it state control over dates of the contests but not necessarily who can participate (see Tashjian v. Republican Party and California Democratic Party v. Jones). If a state party does not like the date of the state-funded primary it can opt out and pay for its own primary or caucus. That is what happened in Nebraska and Montana recently. In both cases, the state-funded primaries were only advisory. Republicans in Nebraska have merely used the May Nebraska primary as a beauty contest prior to a later caucus/convention process. The same was true for Montana Republicans in 2008. The June primary was merely for show following February caucuses that began the true delegate selection process. Washington Democrats likewise have also not utilized the state-funded primary as a means of allocating delegates since a voter initiative brought the presidential primary into existence in the 1990s. There are plenty of precedents Missouri can cite if challenged on a for-show primary along with a consequential caucus process. Can the primary to caucus switch be made? Yes. Will it bring Florida back from the brink? Probably not. But we shall see. 1 The initial Florida-to-January-31 story from CNN did make mention of the RNC attempting to broker a February 21 Florida primary. Those discussions likely included some mention of a Missouri switch. And that probably indicates, more than anything else, that the three non-binding caucus states are a problem to Florida because the reaction to the February 21 proposal was panned by those tied to the PPPDSC in Florida. Georgia Secretary of State Brian Kemp has just announced that the Georgia presidential primary will be held on Tuesday, March 6. That secret came out last night. What was more revealing to FHQ was that Secretary Kemp made several comments about the way in which the Georgia Republican Party will allocate its delegates. The allocation will be proportional, but with winner-take-all triggers. To get any delegates, whether statewide or at the congressional district level, a candidate must clear the 20% vote threshold. A candidate can take all of a congressional district's three delegates (42 delegates in total) if he or she surpasses the 50% barrier in the vote total. Otherwise, the top vote-getter in the district will be apportioned 2 delegates with the second place finisher taking the remaining delegate. FHQ will have to listen back to Secretary Kemp's answer on the delegate allocation question to confirm whether those threshold rules also apply to the 30 statewide, at-large delegates. Those rules can be consequential depending on the dynamics of the race at the time Georgia rolls around on March 6. If the race has narrowed to two candidates, then the likelihood of a more winner-take-most allocation of the delegates becomes much more likely. If the field has not been winnowed much, then a more proportional allocation in application is likely. For more on that see our previous entry on the subject. For more on the implications of this move for Georgia, see last night's post. The AP's Errin Haines is reporting that Georgia Secretary of State Brian Kemp will set the Peach state presidential primary for March 6 at a press conference on Thursday. FHQ has driven a lot of the Georgia as a rogue state discussion since the legislation to hand the presidential primary date setting authority over to the secretary of state was first introduced in the Georgia General Assembly back in March. But the simple truth of the matter is that there was always just as much evidence for or against that notion all along. Early on, the Georgia Republican Party seemed wary of a non-compliant primary's impact on the delegate allocation. At the same time, Kemp made mention of coupling the Georgia primary with Florida's, of jumping the March 6 barrier if Florida did, and of settling on a date after Iowa and New Hampshire. Each time, however, the secretary always stopped short of endorsing a move to any date earlier than March 6. The desire may have been there. The ability was certainly there. Yet, the willingness to jump into January or February was and apparently is lacking. Why, then, should the General Assembly have granted the secretary of state the flexibility to move the primary when all he did was move it back by a month relative to 2008? 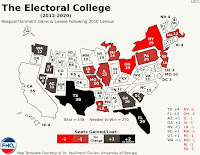 It was after all pretty clear by March -- when the legislation was introduced -- that most of the twenty states that entered 2011 with non-compliant primaries or caucuses were making some effort to move back and not forward. If early was preferred, the legislature could have left well enough alone and kept the primary on the first Tuesday in February or legislators could have moved the primary back to the first Tuesday in March -- the earliest date allowed by the national parties and the date on which the Georgia primary was held from 1992-2004. The answer, of course, is that just because the flexibility afforded the secretary of state -- the same type of flexibility New Hampshire's Secretary of State Bill Gardner has used so adeptly since 1976 -- may not have been useful in 2012 but may be in future cycles. It was a long term change that was left idle in its maiden voyage. 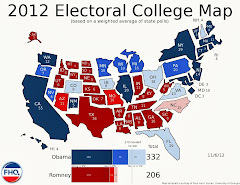 Georgia, then, can stand out from the pack on March 6 based on delegates, but, depending on the dynamics of the race at that point in the race, could end up being hurt if, say, Romney is pulling ahead after the Florida, Arizona, Michigan stretch in the calendar and isn't focused on the South as much as on the general election and in organizing in battleground states like Ohio with early primaries. Yes, that is a fairly specific scenario a little more than five months out, but it is worth noting. One way or another, we will have a definitive answer on the date of the Georgia primary Thursday morning. Arizona: Much Ado About ...a Debate?